I LOVE this - not only is the Marvel Universe LIVE! group putting on fantastic shows, but they're also reaching into the community to inspire and spread cheer to children who need it! Super Hero Skills Test with the Boys & Girls Club of Greater Washington. 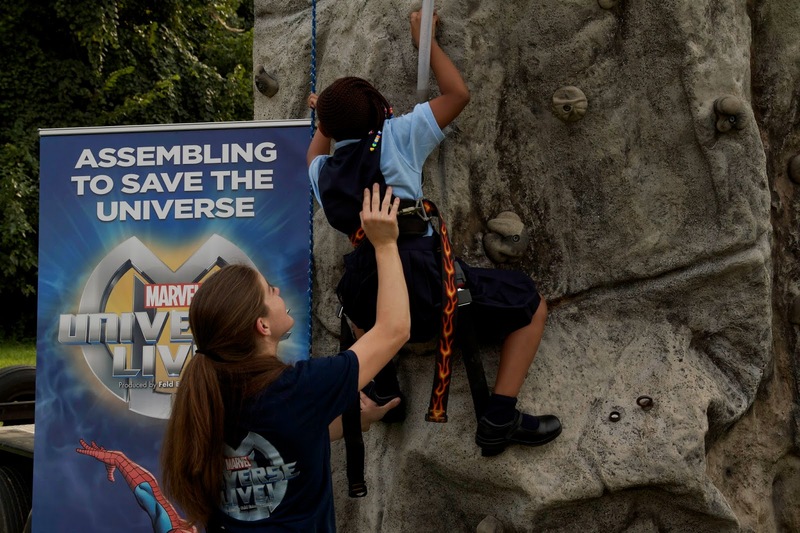 Approximately 50 children from ages 8-10 tested their super hero skills, with the help of some Marvel Universe LIVE! performers, and practiced climbing a wall like Spider-Man, throwing a shield like Captain America, and slamming a hammer like Thor! Who doesn't want to be Superman? Marvel Universe LIVE! is a new live entertainment experience for the entire family. Children and adults alike will enjoy watching their favorite Marvel Super Heroes including Spider-Man, Iron Man, Hulk, Wolverine and many more during a comic extravaganza that brings both heroes and villains to life. Marvel Universe LIVE! will be in the Washington, DC area for three weeks, with performances at the Verizon Center from Sept. 4-7 and the Patriot Center Sept 12 – 21.